In 2011, Stephanie Combs et al published a paper describing the benefits of boxing training for six people with Parkinson’s. They showed improvements in balance, walking, and general quality of life after boxing training. The study also concluded that boxing training programmes are safe for PwPs. Boxing training incorporates whole-body movements, with punching motions and footwork in multiple directions all performed at speed. It provides both anaerobic and aerobic exercise in one session. Each session comprises a full body workout that ensures I am getting fitter and fitter (see example of a typical workout). I love using the wall-mounted speedball and have become quite proficient at it. I received one for my 70th birthday and I really enjoy using it in my home gym. Research has shown that a 60-minute boxing training session results in energy expenditure similar to that of running about 9km (5.6 miles) in 60 minutes on a treadmill. I could not run that far on a treadmill so, if true, the boxing training gives me the equivalent level of cardiorespiratory benefit. And there is nothing quite like pounding a heavy punch bag as hard and as fast as you can – it makes me feel great! After a session, I am physically tired but mentally very stimulated. Aside from the obvious fitness improvements, there are a number of other benefits that I have noticed. The combination of punches that I have to deliver to the various punch bags in the gym have benefitted my hand-eye coordination and improved my strength, flexibility and balance. However, the big surprise for me was the ‘brain training’. By repeatedly moving my legs in pre-determined patterns and punching various combinations repeatedly I am effectively training my brain and body to do this more automatically. The brain is working all the time to remember the punching patterns for so they become second nature. This in turn has helped me handle concurrent multiple tasks, cognitive as well as physical. 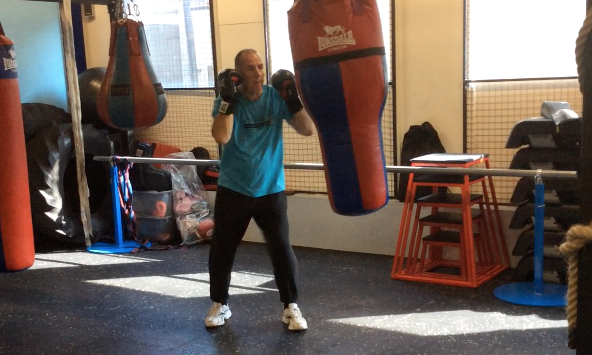 As Mick increases the combinations of punches I have to throw, it becomes more difficult to activate my legs in tandem with the punching, but I can see an improvement over time – although it requires intense concentration! One time I lost concentration and the heaviest bag I was using swung right back at me. I instinctively moved to my left and released a sequence of punches without thinking about it– an automatic movement proven! I have not attempted to reduce my medication – I don’t have that as a goal. I have discovered that, on occasion, I can go up to five hours (normally four hours, after which my tremor generally reminds me) before taking my next dosage of medication. I would like to have that aspect measured, possibly by an MRI scan, to see what dopamine activity is taking place. Is it simply a case of the placebo effect from the endorphins that are released by the intensity of the exercise or is there more to it? I must make clear that boxing training, however wonderful it is for me, is not a cure, although I believe it helps to slow down the progress of the condition. I still have ‘off’ days and ‘off’ periods but overall I am much stronger and fitter, and more mobile and flexible than when I started, and this has helped me going about my daily life. One thing I want to do is get other people to experience the benefits of boxing. Don’t be put off thinking it’s a danger. We don’t box one another, so there’s no danger of getting hit. The physical improvements have also led to psychological improvements which I feel are equally if not more significant for me. I am happier. I believe I can tackle most things, I’m proud of my achievements, more confident about the future and more motivated than ever. I think it’s important for more people to get involved with boxing training. It has certainly improved my quality of life – why don’t you try it and see what it can do for you? Bob attends boxing training sessions for PwPs with Mick Croft at Fitnesszoo in Sheffield, UK. There are 12 PwPs in the class, all in their 50s or above, and with an equal split of men and women.